A stylish & responsive workhorse for presenting your content, with multiple color & font styles. Ideal for news/portal and academic websites. Gorgeous, powerful Drupal themes & solutions for your website. With multiple color & font styles. 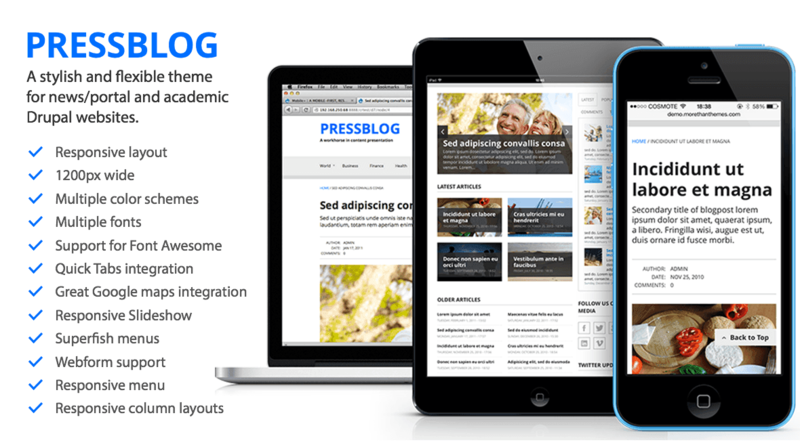 Ideal for news and academic websites. Pressblog adjusts optimally to the width of the browser it is viewed on. As a result, it looks awesome regardless if it's a desktop computer, smartphone or tablet your visitors are using. Monitors constantly get wider nowadays, which is why Pressblog gives you plenty of space for your content, with an initial width of 1200px on desktop – and as much as needed on mobile. Seven carefully selected, awesome color schemes to choose from. Just pick the one that fits your brand with a single click through the theme-settings. Among the great things about the Web today, is the ever wider use of icon fonts, providing access to scalable, quality icons for every use. Check out the complete set of icons. Quick Tabs allow you to create blocks of tabbed content. Making it easy for your visitor to locate your business on the map plays an ever-growing role nowadays, and Pressblog does great in this direction. Promote your nodes to the Slideshow with a single click. Leave the rest to PressBlog. The Slideshow automatically promotes your nodes. Pressblog integrates with the Superfish module supporting gorgeous multi-level drop-down menus with smooth motion. Pressblog integrates with the Webform module and supports gorgeous forms – anywhere you want them. Pressblog comes with a multitude of pre-configured, responsive column layouts [one-third] [two-thirds] [one-fourth] [three-fourths] [one-half] so you can create pages tailored to your needs. Enjoy View blocks ready-made for your ease: Archive, Latest Articles, Older Articles, Popular Articles, Recent Comments, Slideshow, Tags cloud, Twitter Updates and yet much more. Pressblog comes equipped with a plugin which transforms the Main and Secondary menu of your site into a dropdown select list when viewed from a mobile device. And you can configure the behavior of this plugin through the theme settings. Select among tens of different font-schemes, with font-families for all tastes and corporate identities. Just pick the one that fits you with a couple of clicks from the theme settings. PressBlog comes with built-in twitter intergration. Enter yout twitter account into the theme’s config setting and voila: a block with your latest tweets is already there. With its built-in installation profile it’s easy to have PressBlog up and running within a minute. Press Blog comes with built-in and preconfigured ImageCache module. You just upload your photos and they are placed in the way they should be. Thoroughly tested to be fully compatible with all modern web browsers such as Firefox, Chrome, Safari, Opera and IE 9, 10 & 11. "Follow me" links are built-in into the design and functionality. // What's in the pack. // Free update for all existing users. Contact us for more information. // Need help? Here’s the various ways to get help.